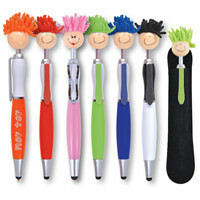 Push button ballpoint pen / stylus with microfibre hair, suitable for cleaning touch screen surfaces. Fun for all. Distinctive when sitting in pockets. Get your message checked out by all who meet a mop top! Optional black suede velvet pouch.